Welcome to Orange January- an annual event celebrating the Orange Prize for Fiction. This blog post will tell you all about the Orange January event, but if you have any questions, please drop me an e-mail at jillceleste AT hotmail. I hope you will participate! Orange January is a personal reading challenge. You make the rules. The only requirement is to read at least one book that has won or been nominated for the Orange Prize for Fiction. Some participants read just one book; others devote the whole month to reading Orange books. Some people write reviews; others do not. It’s up to you on how you want to celebrate Orange January. Is there a list of Orange Prize books? *UPDATE: List of book giveaways has now been posted! Entering is easy! On days when a book is up for grabs, I will announce the book title and a short activity you’ll need to complete to be entered into the random drawing. The announcement will appear on my blog between 6-8am eastern, and participants have until 9pm eastern to complete the activity. Once you finish the activity, mention it in that day’s blog comments so I know who to enter into the random drawing. The activities are quick – usually answering a question – and won’t take more than a few minutes of your time. Additionally, if you still want to participate in the question – but don’t want to be entered into the book drawing – just let me know in your comment. Prizes will be shipped worldwide, and the giveaways are open to everyone! Enhance your Orange January experience by participating on our Facebook page and LibraryThing group. While this is not a requirement for Orange January, most participants have fun discussing books and getting to know each other through these sites. I want to participate in Orange January! Great! If you’re on Facebook, RSVP on our Orange January Event page or let me know in the comment section below. Also, please spread the word to your friends about Orange January. The more, the merrier! Edited to add: We now have Orange Prize graphics! Check out this blog post for more info. Yay, Ally! So glad you can participate! Looking forward to it as always! Like Ally I have set aside two books for Orange January: The London Train by Tessa Hadley and The Memory of Love by Aminatta Forna. A great line-up of books! Enjoy! I can’t believe that it’s nearly here already. Thank you, Jill!!!! Anticipation will get me through the holidays, but I intend to read at least one Orange in December. It’s great to hear from you, Peggy! Have fun! I’m in. I will try and read at least one. Great list of books! Glad you can join us! I hope you find a book to enjoy! Yay! Orange January! No idea what I’m reading as yet, but I will be reading something Orange-y! Definitely! So glad you could join us! Count me in! I’ll definitely remind my readers of this great event! What a great idea, like a giant book group! will you be putting a note of who read which up to get us all talking? Mine too! Glad you can join the festivities! I am definitely in for January! Hope to write a post over the weekend. So many wonderful books to choose from! Have fun picking! I have some winners left too! So many good books, never enough time! I’m in again this January. Thanks for hosting this event. I’m in. I always enjoy the orange months. And so many to choose from. I agree! Way too many wonderful Orange books to choose from! I’m definitely in! I plan to start with The Magician’s Assistant by Ann Patchett. I loved The Magician’s Assistant! I hope you do too! Hi! I participated in Orange July. I didn’t win any books but undaunted I’ve come back for more. I don’t have a FB account (I tend to swim against the current!) so I’m posting here. I will be glad to participate in Orange January. Thanks for holding the giveaway and making it worldwide! Fingers crossed that you win something in January! Best of luck and thanks for participating! I’m looking forward to participating in January. I haven’t decided what I’ll read yet – maybe The Aguero Sisters? Hmm, haven’t heard of The Aguero Sisters. You have piqued my curiosity! I’m in! I’ll be reading Fugitive Pieces. Welcome back, Helen! I hope you enjoy Fugitive Pieces. A very poetic book. Great fun! I should be able to fit this into my Around the World in 52 Books challenge too. I’m in! Sign me up, I love this challenge. Can’t believe I haven’t signed up here yet, but here I am. Ready to enjoy all of that great vitamin C in January. Thank you for doing this Jill. 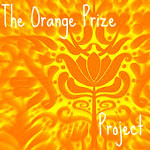 Like the wutheringwillow, I’ve completed my task by subscribing to follow the Orange Prize Project Blog. Can anybody tell me why I hadn’t done that before??? I also suppose that I’d better say that my first Orange of the month is *Fall on Your Knees* which was on the ’97 long list. Hi I’m new and look forward to joining in. Recently moved to a new area and miss my old book club (friendship and reading suggestions). Have a huge pile of books waiting to be read but often need guidance as to where to begin.